Today, the Korean War Commemorative Silver Dollar Coin remembers the dedication of the new memorial 20 years ago. On July 27, 1995, people converged on Washington, D.C. to participate in the ceremonial activities and to see the new memorial. The Gettysburg Times printed the following story providing information about the monumental site. Thousands paid tribute Thursday to the 1.5 million Americans who fought in the Korean War and watched as President Clinton dedicated a memorial in their honor on the 42nd anniversary of the armistice. “They set a standard of courage that me be equaled but will never be surpassed in the annals of American combat,” the president said. Clinton was joined by South Korean President Kim Young-sam. “We are dedicating this Korean War veterans memorial so that all succeeding generations will know how great the sacrifices and devotion of those veterans were and how precious freedom and peace are,” Kim said through an interpreter. After the ceremony—during which scores of people were treated for heat exhaustion—the National Park Service opened the memorial to the public. Visitors streamed past touching the black granite wall and posing for pictures in front of the statues of 19 infantrymen. In the tradition of the nearby Vietnam Veterans Memorial, people left flowers, pictures and notes at the Korean wall. Earlier Thursday, Clinton laid a wreath in Arlington Cemetery at the Tomb of the Unknowns. One tent, called the “memorial kiosk,” housed computerized records of Korean War veterans. Memorial organizers are still collecting information for the database from families of the 54,248 Americans who died in Korea, the 8,168 missing and the 389 POWs who have never been accounted for. Congress authorized the memorial in 1986, but it took organizers six years to win approval from Washington’s fine arts and planning commission. The monument cost swelled to $18 million. 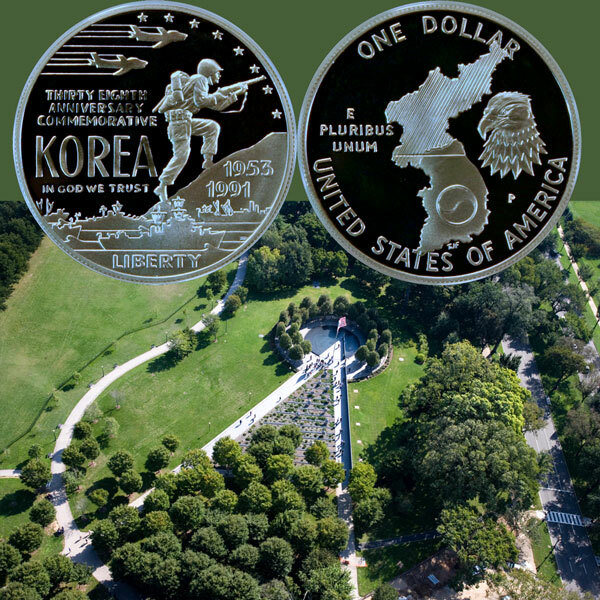 The Korean War Commemorative Silver Dollar Coin shows against an aerial image of the memorial dedicated to the Korean War veterans.